I make some gaudy claims as a strategic advisor. I’ve helped clients make £760 million in additional revenue. In a 30 minute conversation with you, I might be able to add more value to your sales and in profits than I care to mention. If you’re wondering how that’s possible, you’re probably not alone. Businesses like yours have a number of goals that contribute to overall profitability. I’ll help you accomplish any or all of these (and more) in support of short and long-term profitability. That makes focusing on your customers your first priority. That’s how you start a business. It’s how you grow a business. It’s how you pull a business out of a rut. It’s how you take it to the next level. Figure out who your customers are—and who they aren’t—and solve their problems. We’re all human. It’s easy for us to fall into the trap of doing what we’ve always done just because we’ve always done it. As a strategic advisor on predictable revenue growth, it is my job and responsibility to warn you that your customers—both individual customers and your overall customer base—are always changing. Are you changing with them? Did you lose focus when you expanded? Did you do a job that needed doing without asking if it served your audience? How up to date are your predictable prospecting systems and processes to fill your future pipeline of new customers? I’ll help your organisation get back in touch. Your business has achieved a great deal of success. If it hadn’t, you wouldn’t be in the market for my services. Sometimes taking the next step can feel like abandoning the principles—and the people—who got you where you are. You’re not alone in feeling this way, but it might be holding you back. You achieved success. You got here. It took work and dedication and ingenuity, and you did it. But now you want to take the next step. The next step isn’t here, it’s over there. Getting there won’t take the same strategies and tactics that you used to get here. It wasn’t the strategies and tactics that got you where you are, it was work, dedication, and ingenuity, and those are precisely the things that are going to get you there, too, with the help of a trusted strategic advisor. You prioritise what you measure. If you constantly preach quality while constantly measuring quantity, quality won’t improve. With my strategic advisors’ hat on, when I meet your management team, one of the first questions I’ll ask is simply “What is it you’re looking to improve?” From there, I’ll help your team develop specific, measurable metrics that support your objective. Then I’ll help you develop and implement plans to improve your performance. Our brains are remarkably good at finding patterns. So much so that the pattern doesn’t even need to be real for us to identify it. The difference between good decisions and bad decisions often lies in the justification for the decision. Are you making decisions because you think you know what’s happening, or are you making them because your carefully selected metrics are telling you something? “No strategy is better than the people who implement it”. As a strategic advisor and mentor to millionaires, I have lost count of the times I’ve seen expensive, detailed strategies tossed in a drawer to gather dust simply because the people charged with implementing them didn’t know—or didn’t care how—t to implement them. When I work with your team on a strategy, we don’t stop until the people responsible for implementing the strategy are willing and able to do so. Sometimes, that’s simply a matter of educating people on the whys and wherefores. Other times, it’s a matter of revising the implementation strategy to ensure the necessary people have the skills they need. I’ll help you break every strategy down into the smallest possible tasks that, repeated daily, will push the organisation towards its overall goal. That might mean your marketing department hones its message better. It might mean your sales department targets better prospects. It might mean your customer service department has more leeway to deal with upset customers. It might mean optimising all of these, but every task will be tailored to job function and support the overall goal of your organisation. Every implementation involves risk and some implementations will fail. As your strategic advisor, when I work with you, we will do our utmost to identify areas of risk and mitigate them. We’ll build metrics into the implementation that monitor these risks. Doing so ensures that you can confront issues before they get out of control. We’ll continue monitoring areas of risk until we’re sure they’re no longer a risk. Sometimes that’s a matter of days or weeks. Sometimes it’s months or years depending on the size of your organisation. As a strategic advisor and an outsider, I have something of an advantage over your management team. I don’t know what your office politics are like and I don’t really care. If you want your organisation to be truly successful, you need everyone working towards the same goals. There are innumerable clichés about pulling together, rising tides lifting all boats, and success having many fathers and they all got to be clichés because they’re all true. “When intelligent, creative, dedicated people are united in a single purpose, there is almost nothing they cannot accomplish”. When they achieve great things, they will all share in the glory. The project will attract attention and everyone who worked on it will look better. Getting everyone pulling in the same direction is paramount, but if I told you it’s always easy, I’d be lying. Nobody goes into a project thinking they have the worst ideas. The first step in building a consensus is always the same. You need to develop a level of trust between the members of your management team and between your management team and me. That’s why I start every relationship by listening. Your team runs your business every day. Even when they don’t have perfect insight into what should be done, they often have insight into what’s being done wrong. Many of the things we do in business are reactive. A customer has a complaint, we try to make things right. A competitor makes a move, we make a counter-move. It’s all very reasonable, but true success doesn’t come from being reactive. When you’re reacting to someone else’s actions, you’re playing on their turf and according to their rules. That’s no way to win. You win by playing on your turf and by your rules. That means doing your utmost to be proactive. Don’t wait until customers complain because many of them won’t. Go ask them what they’re struggling with and develop real solutions. Don’t rush to counter something your competitor does, watch what customers are doing and get to the next big thing first, just like a Maverick Thinker would do. I can do a lot of things. I’ve had forty years of experience working with organisations that are household names. I’ve worked with more of the FTSE 100 than I’m at liberty to say in public. I have helped my clients with corporate strategies, helped create lead generation systems and with implementations through to sales, develop the right focus, pull together behind a common goal, and achieve great things. By helping successful leaders make even better decisions. It’s not magic. I’m not going to walk in, sprinkle some fairy dust, and lift your organisation to the next level. I am going to work with you on your decision-making processes. I often tout my forty years of experience with top organisations. That’s because in those forty years I have seen almost everything there is to be seen. Having made my share of mistakes and watched others make their share as well and learned from almost every mistake. I am very good at cutting through the nonsense and dealing with the underlying problem. Business is hard, but it’s not that hard. If you understand your customer, identify the roadblocks your customers are dealing with, and work together to provide easy-to-use solutions, you will have success. It’s a lot easier said than done, of course, because we’re all humans with different opinions, ideas, and agendas. If you haven’t read Jim Collins’ Good to Great, about how some companies take the leap, you probably should. In it, he likens a business to a flywheel. Flywheels are essentially heavy wheels that store rotational energy. They’re hard to get spinning, but once they’re going, it’s hard to knock them off course. The decisions you make are what get your business flywheel moving. If you consistently make good decisions in support of the same goals, your business will not only move in the right direction, it will gain strength and momentum. When it really gets going, it will be incredibly hard to knock it off track. That’s when you take the next step, leave good behind, and become great once more by us working together. My services aren’t cheap. Nor are they right for everyone. I specialise in taking businesses with millions in sales to the next level. 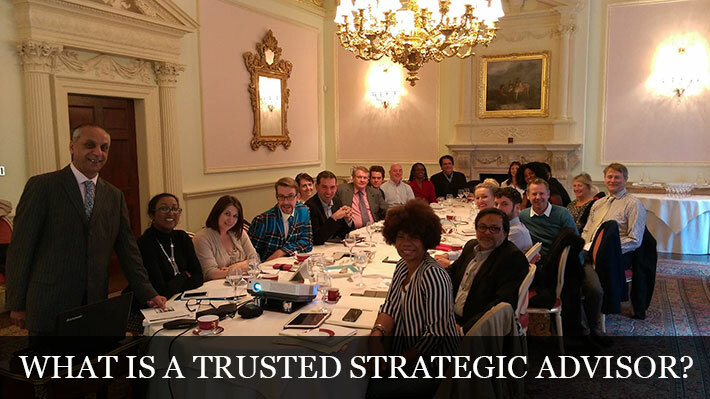 As a strategic advisor, I have forty years of experience working in the trenches with top FTSE 100 leaders and have helped my clients earn hundreds of millions in additional revenue. “Let me be your strategic partner not just your advisor, like a non-Executive Director to help you take your business to the next level”. I know what my time is worth as a strategic advisor or a mentor and I know the value I deliver to all my clients. I go wherever I’m needed in the world and do whatever it takes, so make a good decision. You have read this far down, now, let’s arrange a time to have a chat on the telephone or Skype about taking your business to the next level, just complete the form below and look I forward to speaking with you.